Cesc Fabregas Wife Daniella Seamaan Reason Why Barcelona Midfielder Signed With Chelsea? Mrs Fabregas could be the reason why Cesc moved to Stamford Bridge. 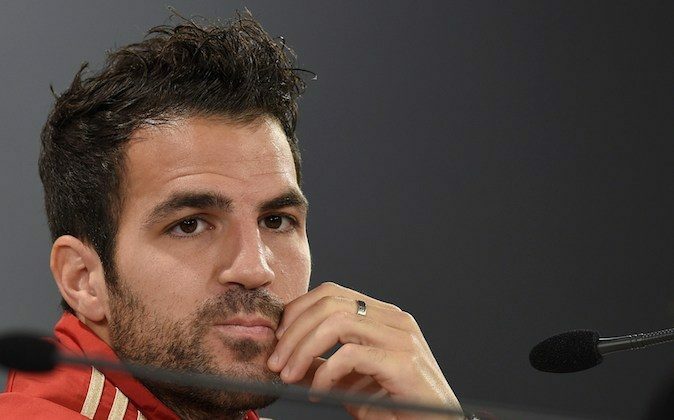 According to Marca, Daniella Seamaan preferred that Fabregas moved to London instead of the Manchester area (Manchester United and Manchester City were interested in Fabregas) because the couple have a £5.5 million ($9.3 million) flat in Belgravia. Given that Chelsea and Arsenal are London rivals, Fabregas can expect a frosty welcome when returns to the Emirates Stadium next season. Here is an AP article on Spain’s expected line up against Chile in their World Cup 2014 match. RIO DE JANEIRO (AP) — Spain coach Vicente del Bosque promised on Tuesday to change his lineup for the team’s must-win Group B match against Chile as the World Cup holders look to stay in the tournament. Forwards Pedro Rodriguez and Cesc Fabregas are widely seen as the most likely candidates to start on Wednesday after the 5-1 thrashing by the Netherlands in their opening match, though Del Bosque was not giving away any names. “There will be changes, but few,” Del Bosque said at the Maracana stadium. While Pedro would probably replace David Silva, Fabregas could slot in for Diego Costa if Del Bosque decides to leave the physical striker on the bench in place of a ‘false striker’ attack. Defensive player Javi Martinez is meanwhile a candidate to slot in for Gerard Pique, while fullbacks Cesar Azpilicueta and Jordi Alba are under scrutiny. Spain was looking forward to the match finally getting underway after four long days since Friday’s humiliating defeat by the Netherlands, the losing finalists in 2010. “Anxiousness can also allow you to play better. The worst thing would be indifference. It’s good to be a little anxious, but always in measured doses,” Del Bosque said. Spain was grappling with a psychological blow unlike any other it had experienced, according to Del Bosque, during its incredible run of winning two European championships, either side of the last World Cup. The opening loss in Salvador was its worst competitive defeat since a 6-1 loss to Brazil at the 1950 World Cup. Spain finishes Group B play against Australia, which lost 3-1 to Chile. Spain would remain alive with a draw against Chile, although it would complicate things for the defending champions. Andres Iniesta looks set to stay in a lineup that has to retain Spain’s attractive style of football — but must also be more efficient. Against the Netherlands, Spain’s normally slick passing game stuttered, while the possession it thrives off of was disrupted by a stronger, steadier opponent in Salvador. Having conceded five goals in open play, Spain knows it must adapt to the situation. “We have to win by whatever means necessary,” Iniesta said on Tuesday. In 2010, Spain lost its opener against Switzerland but went on to win its final two group games, including one against Chile. Iniesta, who scored Spain’s winner in its 1-0 victory over the Dutch in the 2010 final at Soccer City, believes that similar success in this group stage is just around the corner. “We’re full of confidence that we can do it, that we have the team to do it,” Iniesta said.